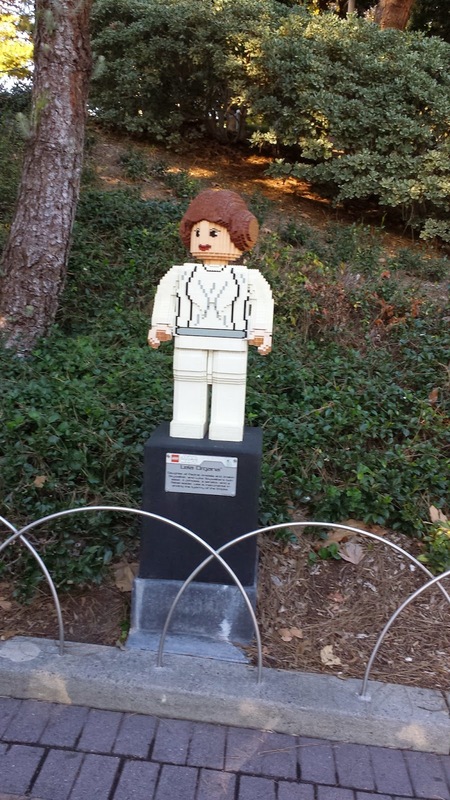 Stellar Four: Are you LEGO-Experienced? 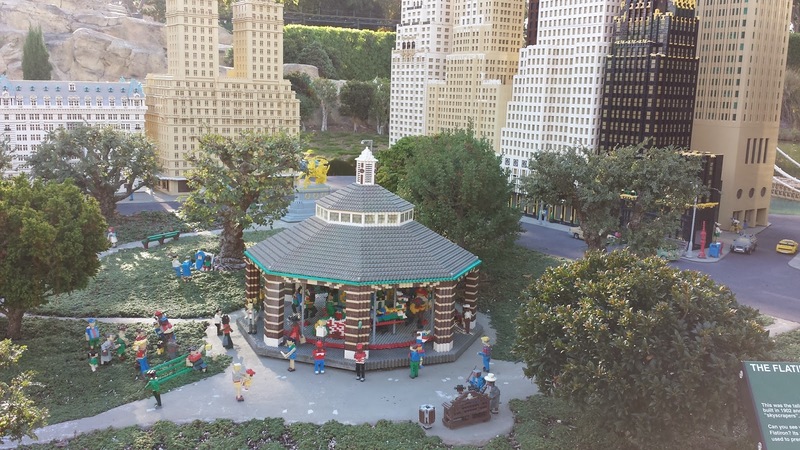 I mentioned in last week's thankful post about the family's trip to LEGOLAND California. We went, we saw, we built, we danced to disco in the elevators, and all around had a fantastic time. 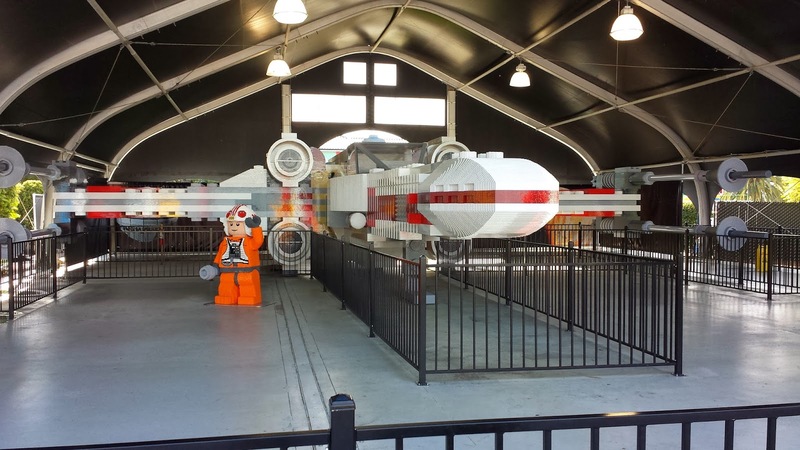 I would note that I have a kid who is obsessed with LEGOs and the older one does not like roller coasters. Baby is cool with whatever. The ideal age range seems to be 5-7, although there were older kids who enjoyed themselves. I did come across some of the more jaded of the tween set, though, and I had to move away quickly before they sucked all the joy out of the immediate vicinity. If you hate the idea of being around very loud running children, then this is not the place for you. If you have a need for speed, this is not for you. If you still break out the LEGO building blocks and are fine with sitting on the sidelines while your kids drive a car or boat or build a robot, then you are the target demographic. I've been to the Disneyland Resort more than a few times. 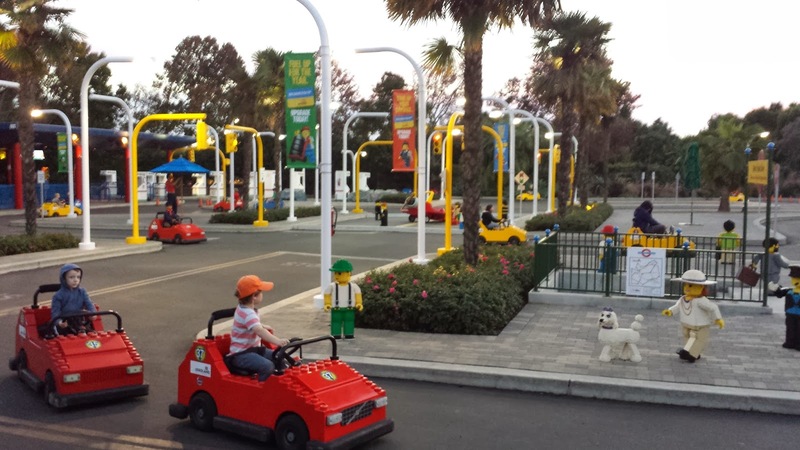 LEGOLAND is smaller, less crowded, but has fewer rides for older kids/teens or adults who love coasters. There are also fewer high capacity rides, so although it is less crowded, you'll still find lines. They were still shorter than what we experienced in the House of Mouse. It's also cheaper than spending the day at Disneyland, so there's that too. 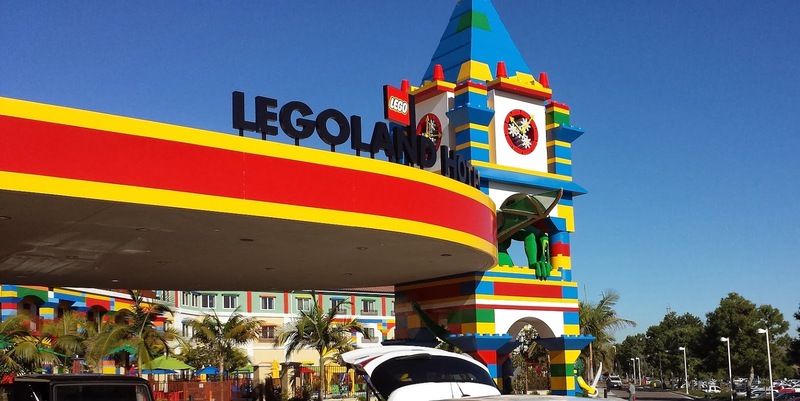 We started our stay by checking into the LEGOLAND Hotel. 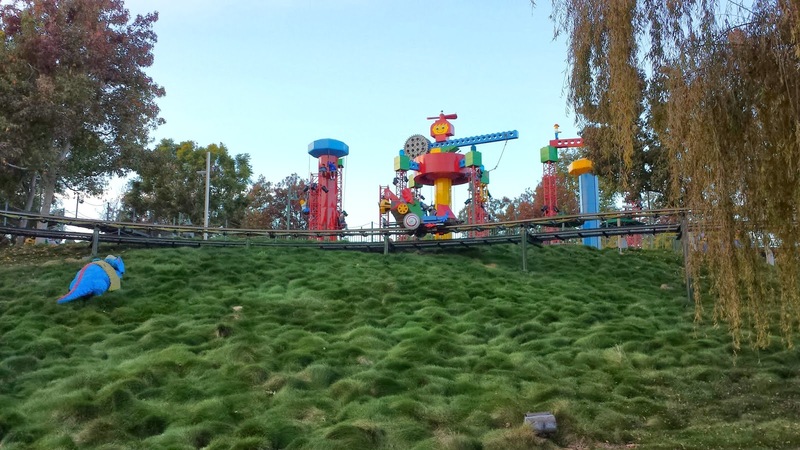 Given the horror of Southern California traffic we decided to drive up around lunchtime, stay overnight in the hotel, then head into the park the next day. This was an excellent plan. The hotel is a playland all in itself. 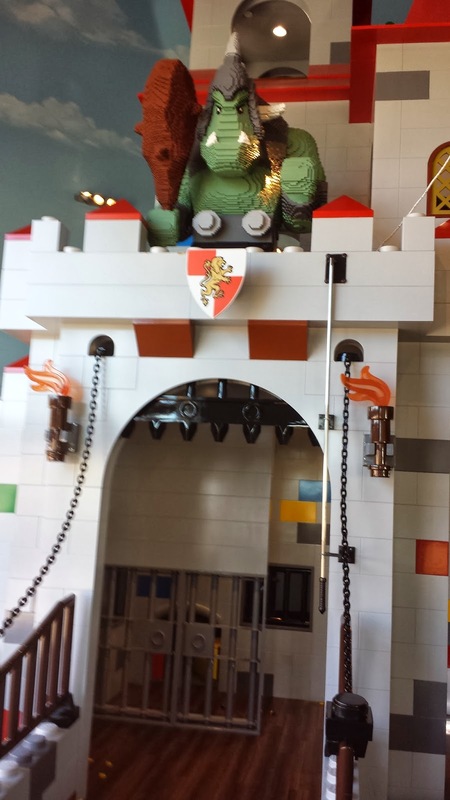 A dragon overlooks the entrance and a veritable river of LEGOs awaits you. 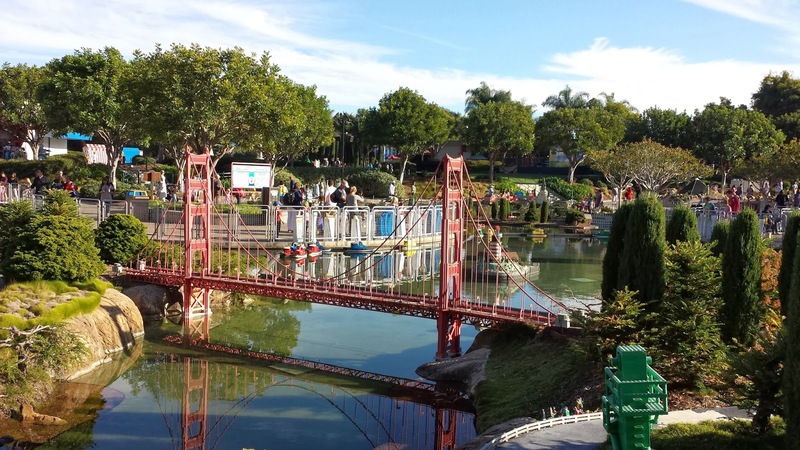 There actually is a "LEGO pond" right next to registration filled with LEGOS. The boychild jumped right in. 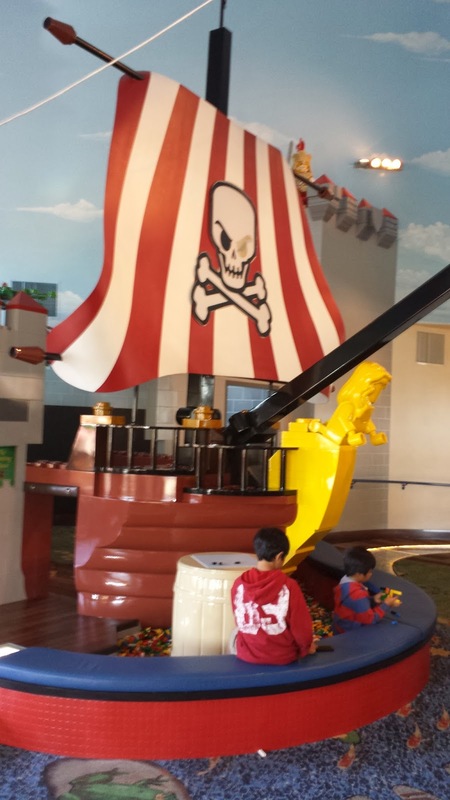 Then, the LEGO-brick road leads you to the pirate ship and castle, with more LEGOs to play with, a belching ogre, and a few other little surprises. There are lots of fun things to discover. From the disco elevators (one of the highlights of the trip) to the whoopee cushion in the floor, to the LEGO figures throughout, to the very funny signage, you could tell that people designed this with a kids sense of humor in mind. The fun did not stop in the lobby. Every room at the hotel has a theme: Kingdom, Pirate or Adventurer. I think that the Pirate is the most popular. Those rooms were booked already when we made our reservations. We chose the Adventurer theme, and it was a mighty good choice. 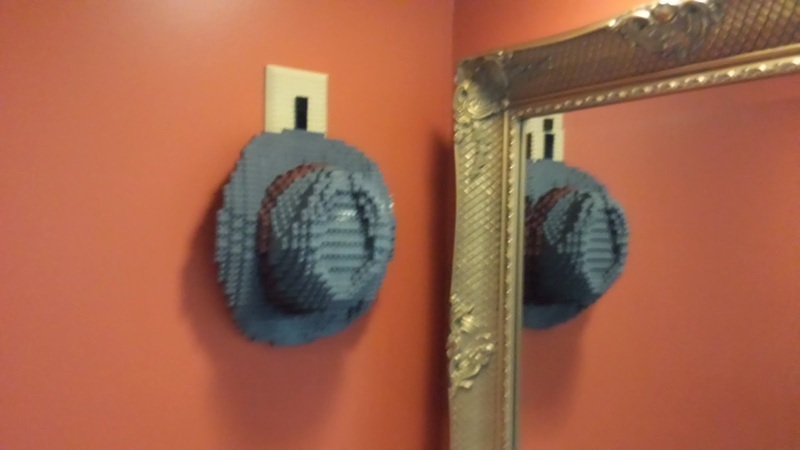 From a LEGO fedora on the wall to scarab beetles, a scorpion, mummies on the duvet and the shower curtain, from carpet to ceiling the theme was used throughout. 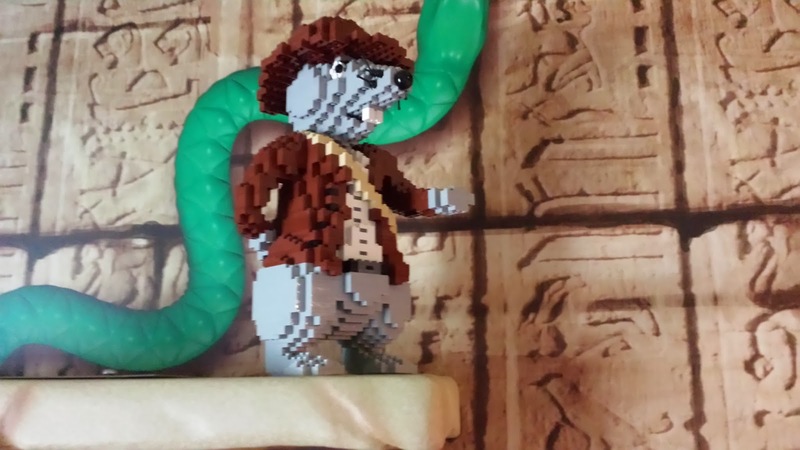 My favorite was the "Indy" rat on top of the TV in the kids room. Yes, I said the kids room. This hotel was made for families, so in addition to the Queen or King size bed, there is also a bunk bed with a trundle. In the suites you'll also find a pull out sofabed. We went with a couple of other family members and had 7 people sharing a room. It worked just fine. 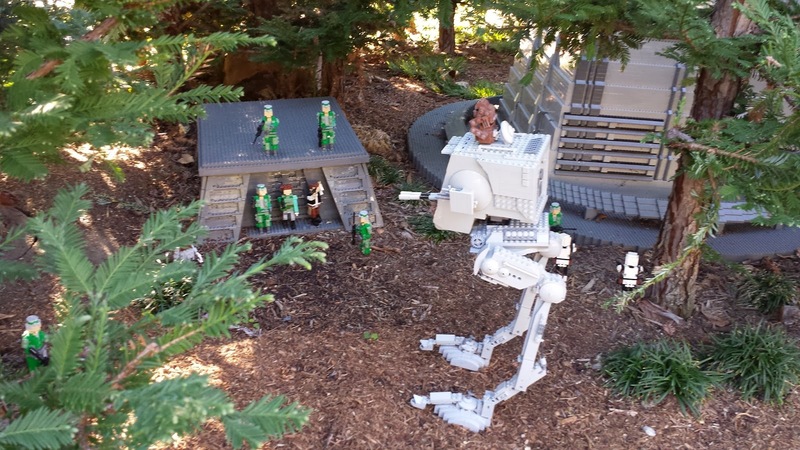 It would not be the LEGOLAND hotel without LEGOs, right? You'll find a box in your room to play with during your stay. There is also a treasure chest. To open it, the kids had to find a few things around the lobby, restaurant and room. You get to keep whatever treasure you find. This was a huge hit. After settling in a bit, we took the kids down to the lobby to play in the castle. Here is another detail where the developers oh so knew what they were doing. Across from the play area is a lounge with pastries, coffee and a full bar. It was happy hour when we arrived. Oh yeah! We settled in at a table with a clear view of the kiddos and stayed there for over three hours. THREE HOURS. Without a single "I'm bored!" Near evening it got a lot more crowded, but remained comfortable. The evening program consisted of a knight teaching an adventurer class - dancing, sword fighting and a parachute were involved. After that was a building competition, followed by a kids improv thing that we didn't see. The kids were worn out so after a couple of cartoons on the LEGO network, it was dreamtime. We got an early start the next day. Included with your room is free breakfast in the buffet - and I'm not just talking cold cereal and some bagels. This was a full buffet with lots of choices. It is best to get there when it opens as the line does get long. Be sure to check with the restaurant as to the exact time. We found out that the restaurant was opening a half hour early due to the large occupancy of the hotel that week. After breakfast we headed to the park. Hotel guests get in early, which is another big perk. Also, ticket prices are cheaper if you buy through the hotel. 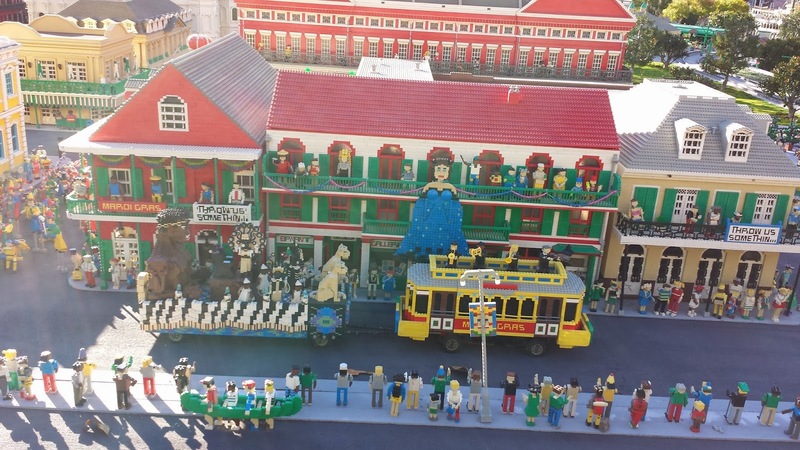 Inside the park are rides, three roller coasters, play areas, interactive fountains, opportunities to build your own LEGO creations, 4D movies, and a Miniland with famous landmarks made from LEGOs. The coasters are decent. There were a few dips and quick curves, but no loops. We only got to try the Coastersaurus and Dragon, the TECHNIC broke down just as we got to it. Good starter coasters for either kids who are a bit afraid or for ones who aren't yet tall enough to go on the bigger rides at other parks. That was a big plus for us, the two older kids could ride everything in the park. There are quite a few interactive rides, like the Kidpower Tower where you pull yourself up a tower then gently fall back down. There were two 4D movies, Chima and Clutch Powers. I think it's safe to say that right now the Chima one is the most popular right now. Get there a bit early to get in line. The kids favorite was the Driving School where they got to be behind the wheel. There is one for 3-5 year olds, then a bigger one for 6-13. They get in a car and drive on streets with traffic lights, stop signs, and other cars. You might be thinking that it would be bedlam, and it was a bit chaotic, but there weren't any bumper car shenanigans. The food was pricey, as themepark food usually is. We ate at the BBQ place in Castle Hill. It was good and there were more options than just burgers, hot dogs and pizza. We also got ice cream, which came in a waffle cone and was way better than expected. My favorite, though, was the Apple Fries. Apple bits fried and coated in cinnamon sugar and served with vanilla whipped cream. I'm drooling just thinking about it. The kids said they didn't want any. Then they wanted to try just one. Then they ate half the box. I need to try to recreate it at home. 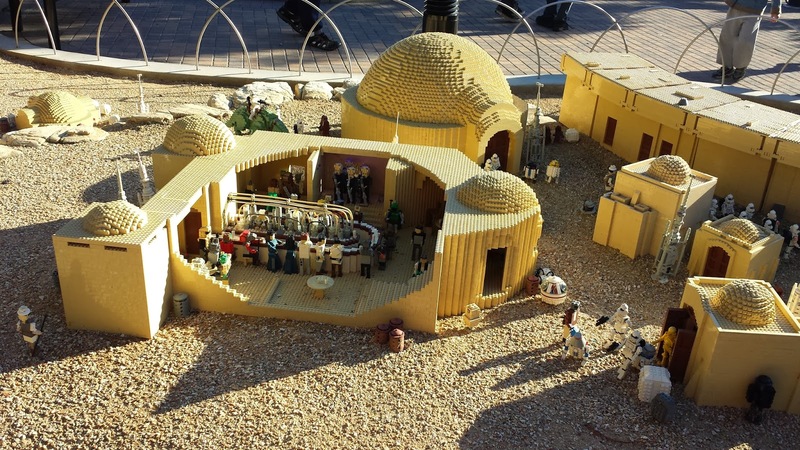 My favorite of all has to be Miniland. 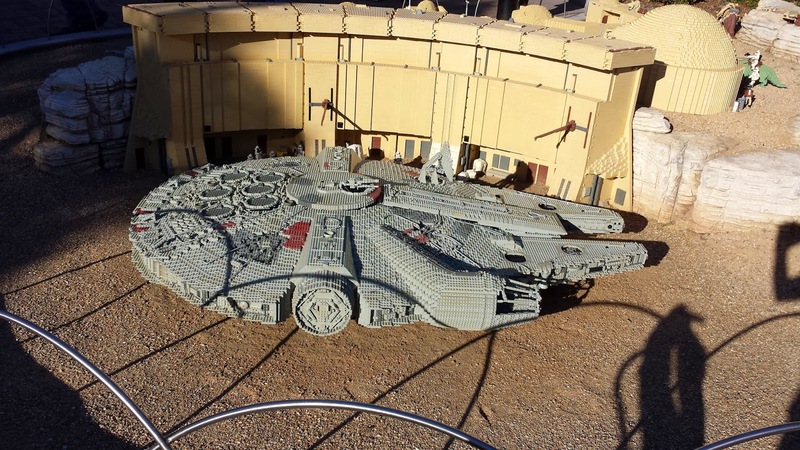 With landmarks from DC, New Orleans, Las Vegas, NY, San Francisco, LA and more, as well as the Star Wars section, this kept the attention of the whole family. The detail was amazing. 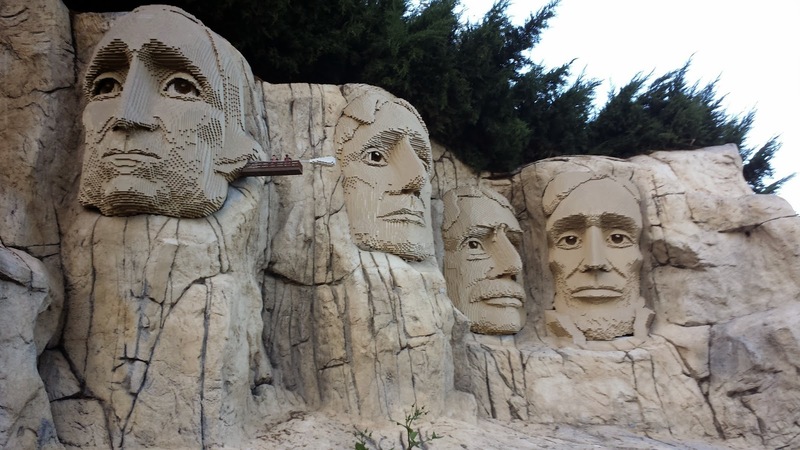 I want to put one in my backyard. It's doable, right? 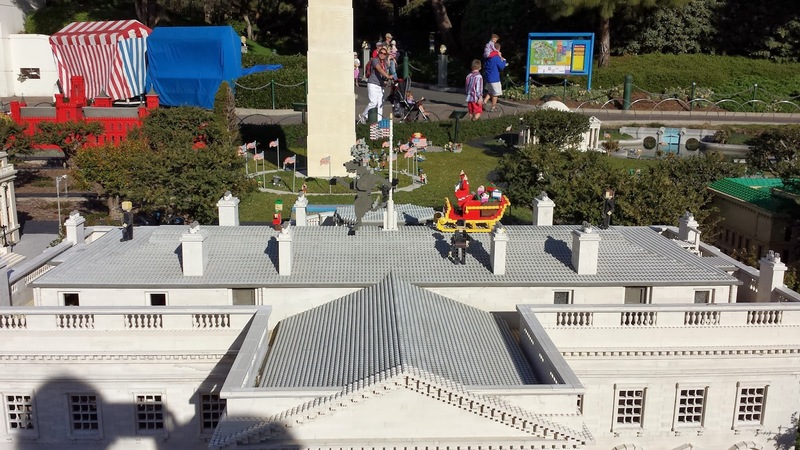 Santa surrounded by the Secret Service on the roof of the White House. Prancer is making a break for it.